The Amaz!ng Meeting | A Celebration of Science, Skepticism and Critical Thinking. SAVE THE DATE: We are happy to announce that The Amaz!ng Meeting 2012 will be held July 12-15, 2012 at the South Point Hotel in Las Vegas, NV. ALERT: TAM 9 was a smashing success with over 1650 skeptics from around the world. 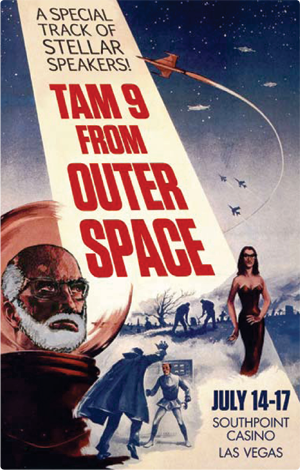 Read James Randi's thank you to TAM9 attendees. The Amaz!ng Meeting (TAM) is an annual celebration of science, skepticism and critical thinking. People from all over the world come to Amaz!ng Meetings each year to share learning, laughs and the skeptical perspective with their fellow skeptics and a host of distinguished guest speakers and panelists. Join us for four days of fun, fellowship and critical thinking—register today! For TAM Las Vegas 2011, we’re proud to announce one of the best programs we’ve ever had, with more speakers, panels and workshops than any previous TAM. Just take a look at the complete list of speakers, panelists and workshop presenters and see how truly amaz!ng it is! This year’s TAM will also feature as one of its themes a special space science and skepticism focus, titled “TAM 9 From Outer Space,” including a keynote address from science superstar Neil deGrasse Tyson, director of the Hayden Planetarium and host of the PBS program Nova ScienceNow. We are happy to announce that our Master of Ceremonies this year will be the inimitable George Hrab! But the best thing about TAM? It’s the community. You’ll be with hundreds of other people who prefer the world the way it really is: real. Enthusiasm for TAM grows every year. And this year will be the largest TAM yet, with more speakers, more panels, more workshops, and more skeptics than ever before. Make sure to follow @jref on Twitter for #TAM9 news and announcements. Skepticism isn’t just something you think, its something you do! We’re pleased to announce an expanded number of hands-on workshops this year, for a total of ten, while still offering the popular All Workshop Pass at the same special price as last year. Workshops offered this year include: Defending Evolution, Skeptical Activism , Advancing Skepticism Online, Investigating Monster Mysteries, Raising Skeptics, and many others. The schedule of all ten workshops can be found here. Our evening events are among the most talked-about and memorable aspects of The Amaz!ng Meeting. Separate ticket purchases required. Have a good time with fellow skeptics at the Rebecca Watson Game Show & Variety Hour Thursday night. Have dinner with the cast of the popular radio show and podcast Skeptics Guide to the Universe! Join Steve, Jay, Bob, Evan and Rebecca at this optional dinner on Friday. Note: This fundraising dinner is not included with the The TAM Experience Package. Why so serious, skeptic? Join Showtime’s Paul Provenza as he presents a night of skeptical stand-up comedians with ¡SATIRISTAS! on Friday night. It’s not exactly a one-man show, because it involves hundreds of minds… Including yours. Come see Max Maven’s acclaimed Thinking in Person Saturday night. Didn’t think TAM could get any more amaz!ng? Check out these other activities taking place at and around TAM. Getting into town early? Head over to the Del Mar Lounge on Wednesday night for a special TAM version of Drinking Skeptically and Skeptics in the Pub. Enjoy live recordings of your favorite podcast, The Skeptics Guide to the Universe, on Friday and Saturday. Witness a live demonstration of supernatural abilities (or not) at the Million Dollar Paranormal Challenge Event featuring Banachek, on Sunday. For more information about these activities (and more), please see our events page. Enjoy a private luncheon with James Randi, Richard Dawkins, Carol Tavris, Bill Nye, Penn & Teller and other speakers! Don’t miss the opportunity to have an intimate catered luncheon with James Randi, Richard Dawkins, Carol Tavris, Bill Nye, Penn & Teller and other selected TAM luminaries. As a fundraiser for the JREF, we are offering an exclusive luncheon limited to 20 people. Enjoy all of this and much, much more! Any many more! A complete list of speakers and panelists can be found here. A list of workshop presenters can be found here. © 2012 James Randi Educational Foundation. All Rights Reserved. TAM photos by Ingrid Laas and Scott Hurst.